Good colour retention, easy to clean, highly durable and resists mildew, abrasion and moisture. Inexpensive. Polyester is a popular synthetic fibre used in carpets. Less expensive than nylon, it once had a reputation for being of poor quality. In recent years, polyester fibre has been improved considerably. It has its advantages and can represent an excellent value for certain applications. Polyester carpets present a beautiful appearance. The fibre has a very luxurious feel and also comes in some of the richest colors of any fibre. Because it is process-dyed, it has excellent fade resistance. Polyester's relatively soft fibres give it a rich feel and looks great. Thanks to technological advances in yarn processing and improved carpet construction techniques, polyester's perceived weakness as a high-performance fibre has been largely overcome. When properly twisted and tufted, today's polyester yarns perform much better than in years past. Polyester styles are good choices for low - to medium - traffic settings such as bedrooms. 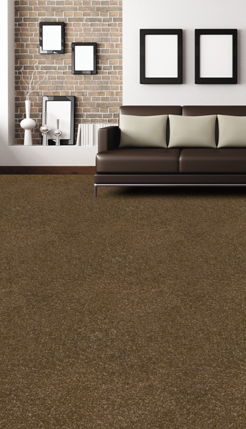 Call Flooring Vision today to discuss your requirements and which type or carpet will provide you the best solution.